We are about to plan the perfect summer date or ladies’ night out for you in Chicago. Ya ready? First, you head to 720 South Bar & Grill for cocktails and the most beautiful cheese plate you’ve ever seen in your life. 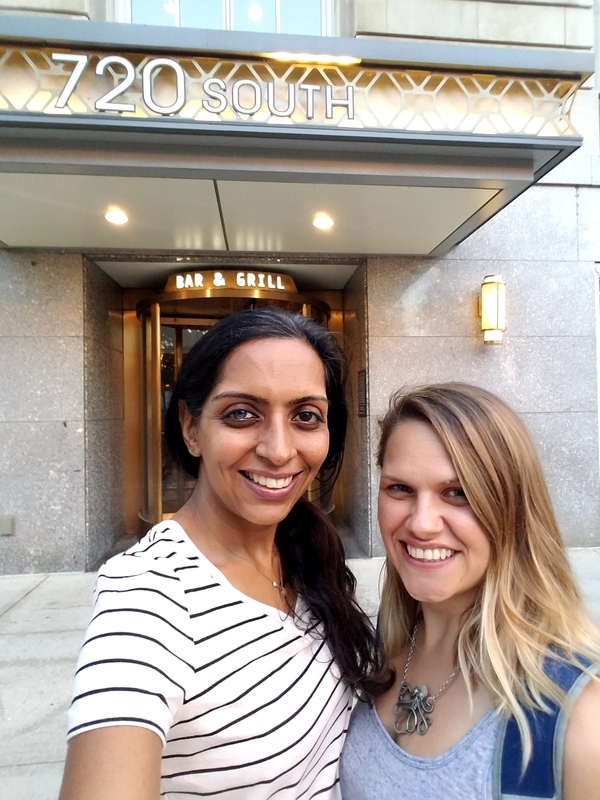 Then, after having an amazing dinner, you head to SummerDance at Grant Park right across the street and learn a new dance style (think Swing, Bollywood, Samba, Zydeco, and more!) surrounded by the gorgeous backdrop of Chicago’s skyline. After you’ve made room, come back to 720 South Bar & Grill for more libations. Eat, sweat, repeat! 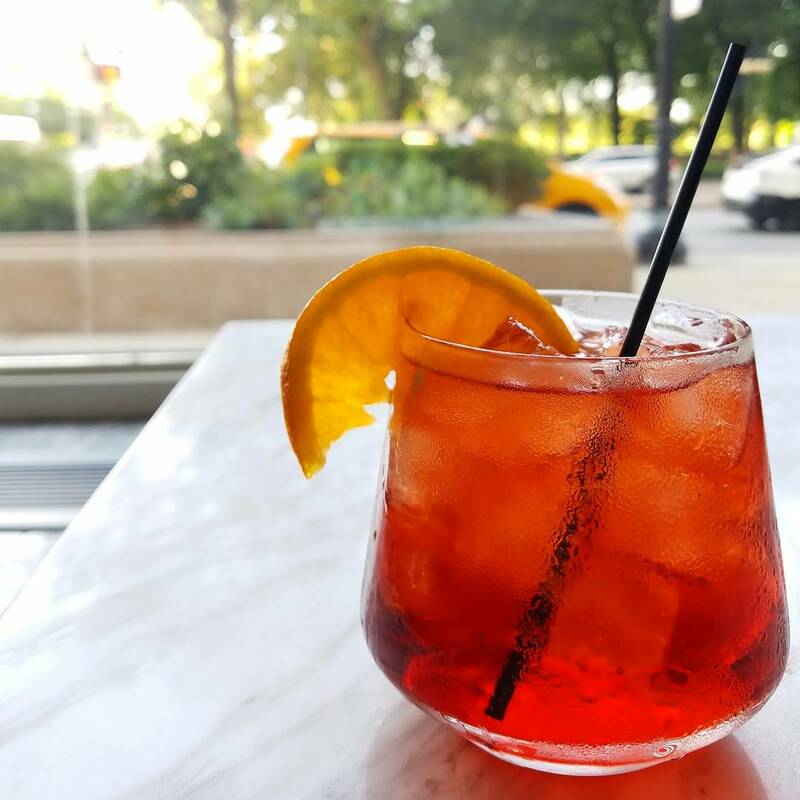 We had an absolute blast being treated to a meal at 720 South Bar & Grill recently for Negroni Week. We didn’t even know this sweet spot existed and usually aren’t too impressed with hotel vittles. 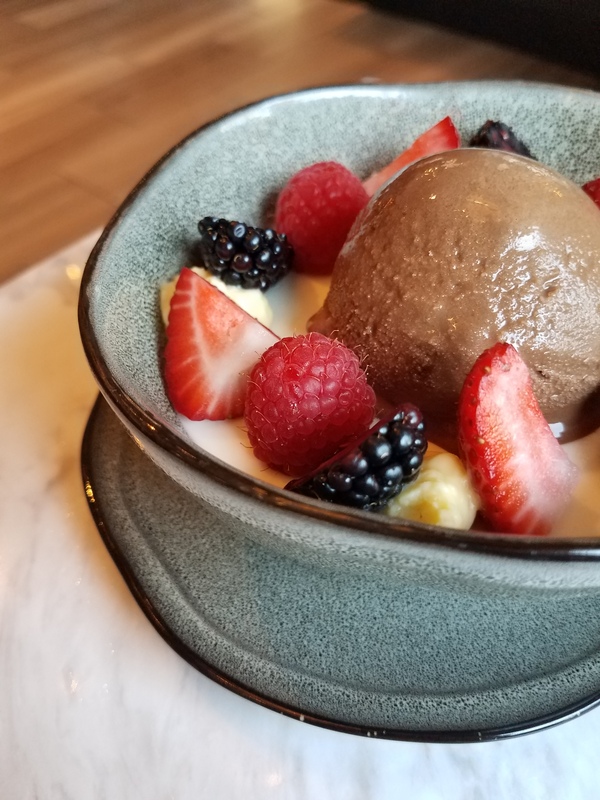 Nestled in the Hilton Hotel, 720 South Bar & Grill, has an intimate quiet vibe with marble tables and impeccable service. The Hilton is a historic and beautiful hotel situated right in the heart of our city. You can read more about it here (including some 1920’s scandal and maybe ghosts?). Once we arrived, we were whisked away to our private table beside the sunny windows that face Michigan Avenue. We started with a Negroni with rum and the Hilton Chicago’s 90th Anniversary Cocktail, the Boulevardier. This bottled cocktail was poured for us tableside. It’s a twist on the classic Negroni with templeton rye instead of gin, mixed with sweet vermouth and zesty orange campari. 720 South Bar & Grill is actually a haven for bourbon and whiskey lovers. 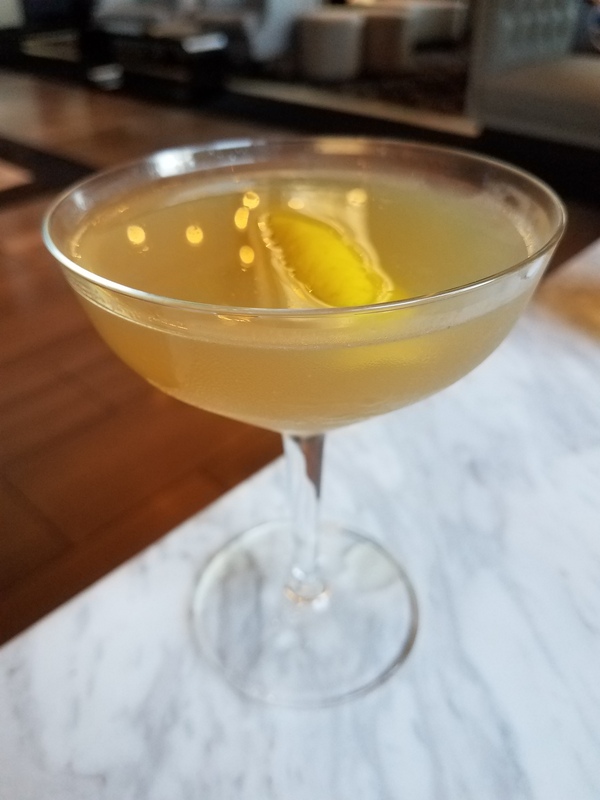 Al Capone, one of our most notorious Chicagoans, swigged an iteration of this cocktail during prohibition times. We found it to be more balanced and delightful than the super bitter rum Negroni. 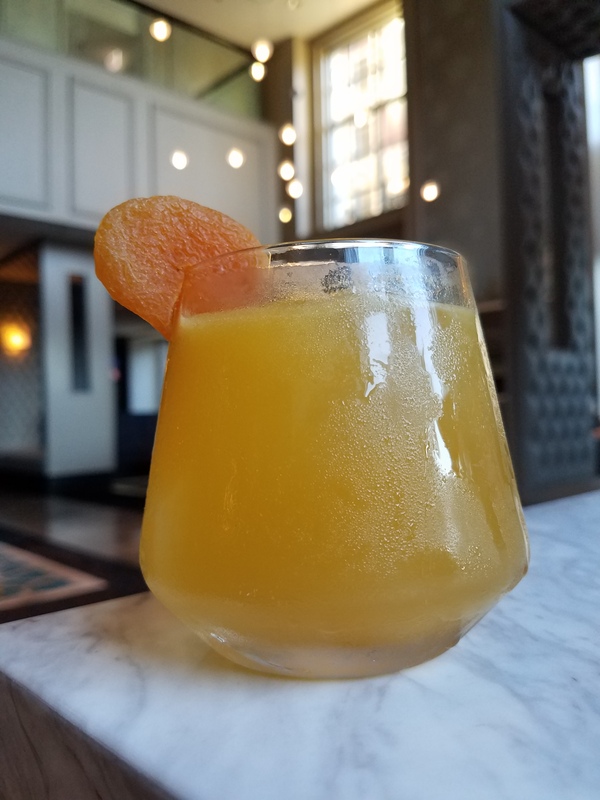 Other summer drink suggestions to wow your guests, especially if you prefer less tang than a Negroni: The refreshing Gold Rush with old forester classic, 86pf bourbon, acacia honey syrup, and squeezed lemon juice or the Sunshine Daydream with local FEW bourbon, giffard abricot du roussillon liqueur, mango purée, splashed with tart lemon juice. 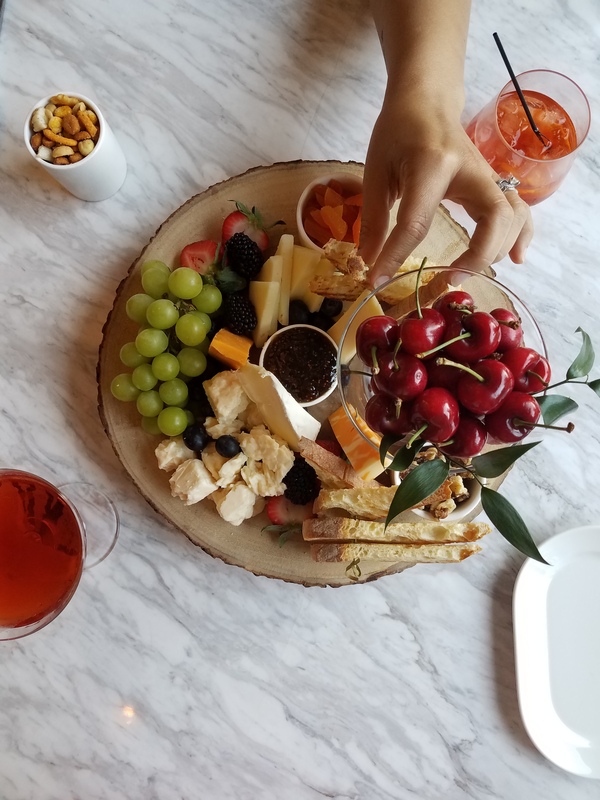 Our appetizer was the favorite, a gorgeous and fulfilling cheese plate, with sweet cherries swimming in a martini glass, surrounded by craft cheeses, nuts, and dried apricots, delicately laid out on a slice of wood. This dish is made to impress AND share! It was followed by our entrees: a hearty house made black bean chipotle burger, chili soy glazed wings, and rich cheesy truffle fries. We were so full from gorging on cheese, it was hard to indulge! We championed through it though (with to go boxes in tow) and were satisfied. 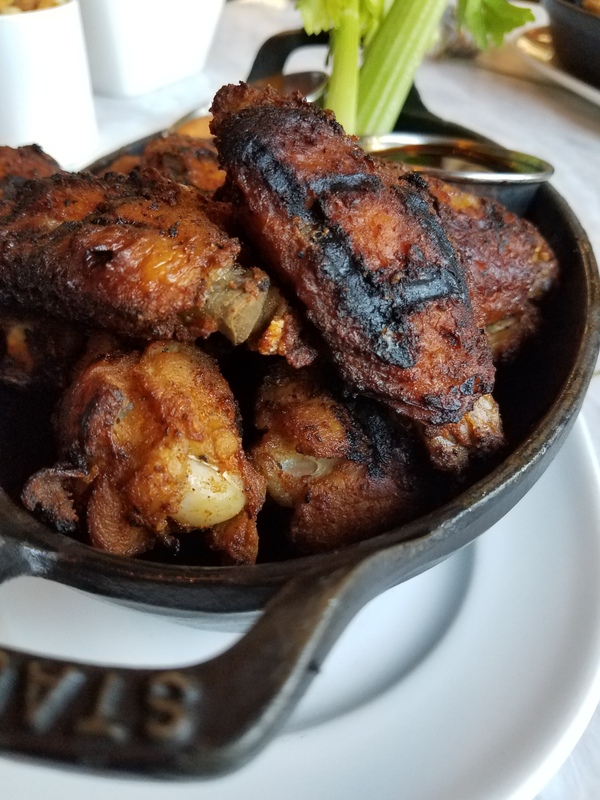 Kate doesn’t usually like meat on the bone but found the wings to be juicy and peppery. 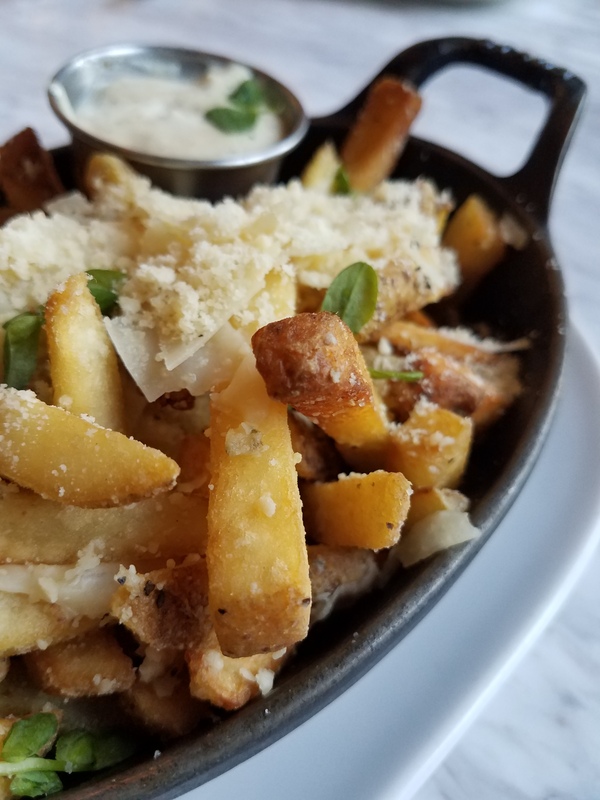 The truffle fries were crispy and garlicky and could rightfully serve 4-5 people. 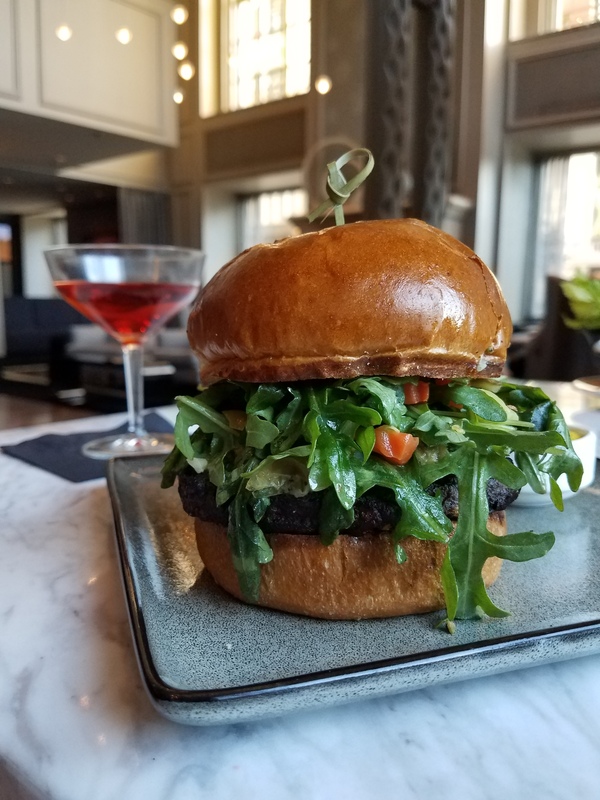 The black bean burger was packed with fresh veggies on a buttery bun-great for vegetarians and meat lovers alike. 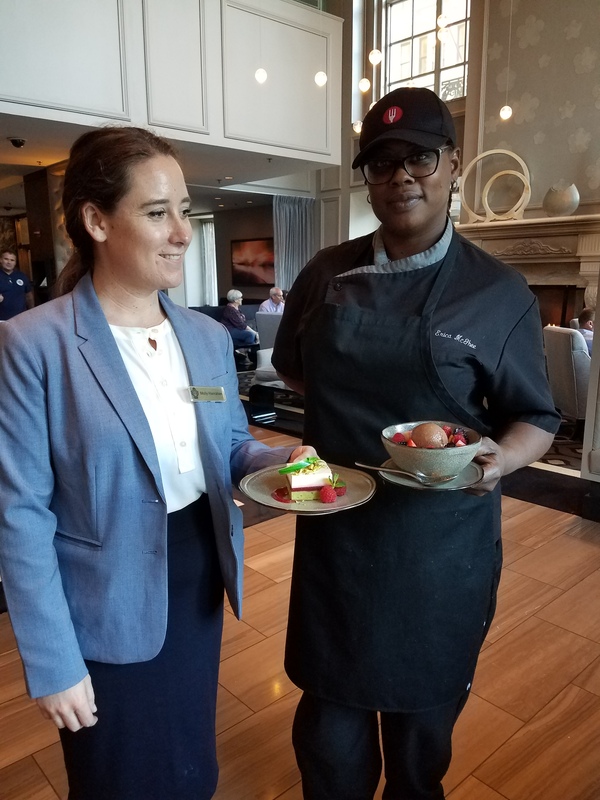 During our dinner, we were introduced to the humble and friendly Chef Erica McGhee and learned about the Hilton’s secret rooftop garden. Chef Erica McGhee centers the menu around fresh local produce from the garden as well as other Midwestern elements. Chef Erica learned to cook from her grandmother and dreams of owning her own restaurant someday, named after her culinary inspiration. We look forward to following her future endeavors! 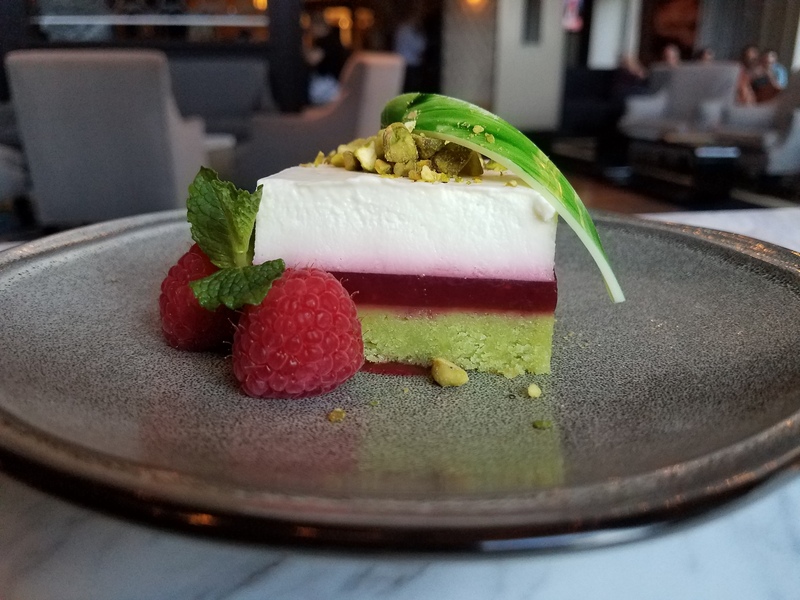 As if that weren’t enough, the amazing hospitality team treated us with pistachio raspberry pana cotta cheesecake with white chocolate lychee panna cotta garnished with fresh berries and chocolate sorbet. See, now that you’ve indulged and your inhibitions are swayed, dancing under the stars will put the perfect hum to your evening! Check out the SummerDance schedule here and when you visit the 720 South Bar & Grill, don’t hold back! You’ll love the ambiance and selection of this joint. We are so grateful for the team at 720 South Bar & Grill and hope to come back to tour the rooftop garden. Our opinions are our own but we were treated to a free meal and drinks! What’s your go to spot in the loop for dinner before summer time events? Let us know in the comments! !